This is one of the hollyhocks, on that long stem, I showed in my SOOC post. These blooms are very dark red, and usually photograph almost black. I thought the morning light coming from the back really showed off the color. 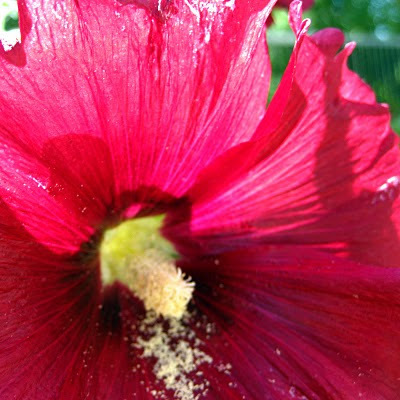 the creamy yellow pollen makes such a nice compliment to the deep red of the flower. Pretty color. I find dark pinks and reds are hard to capture. Mine often turn out a lighter color than they really are. Lovely photos...I used to make leis from these blossoms when I was a kid. 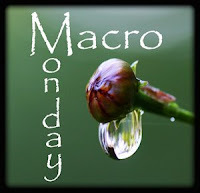 My macro wildflower Do drop by if you can. What a beautiful flower and color! It looks great with the backlight! Hollyhocks - old-fashioned and lovely. a little bit of a dusting on the petals is a lovely effect.